Cargo doors on a shipping container are the heavy-duty, weather-tight, secure swinging doors located at the end of the container. And when it comes to opening and closing the container, the task can be a bit challenging for a novice. That's why we've created a short, 2-minute video to help you understand exactly how easy it is to open and secure shipping container cargo doors. But before you watch, here's a quick 411 on cargo doors. 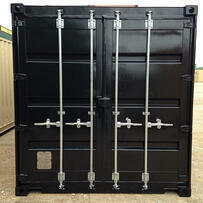 Constructed of heavy-duty, 16-gauge steel, shipping containers are incredibly difficult to break into. This is due in no small part to how the cargo doors are designed. The double doors on most standard ISO containers are fitted to one end, and are hinged at the edge so that the entire end can be opened. The doors use a thick rubber gasket all the way around to keep the door sealed from weather and other environmental conditions. They use steel bars, along with a cam and lock system, and therefore take a bit of finesse to open and then properly secure. But with a bit of practice, you’ll be accessing your container - and all the great things you choose to store inside it - quickly and easily. Tip: The biggest mistake first-time users make in opening portable storage containers is trying to open the left-hand door first. Always start with the right-hand cargo door and pull both handles at the same time. Then move on to the left-hand door. Here’s that short, 2-minute video to show you how to become a container pro! If you still have questions or concerns about the ease of accessing your conex box, or any other container related questions, give us a call at 877-704-0177. Or if you’re in the Austin, Texas area, stop on by for a personal demonstration.